Bongo is made from a brown material with black button eyes and black stitching for his nostrils. His face, ears, hands and feet are all made from a tan coloured material. Bongo also has a tan coloured tail. One of these days he will be a big star! Bongo the Monkey was introduced on 17th August 1995. This version of Bongo has a tan coloured tail. A version with a brown tail the same colour as the body also exists. Originally Bongo was called “Nana”. 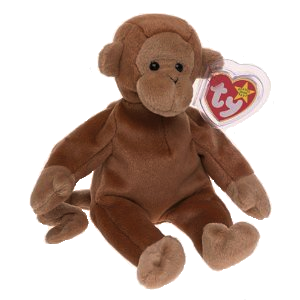 The Beanie Babies with the original Nana tag are among the most sought after Beanies available and are worth a lot of money on today’s market.